The Sheraton Waikiki hired PointCloud Media, a full-service production company specializing in 3D projections, to develop innovative, energized shows featuring graphic figures and images projected onto the nearly 200,000 gallon pool. 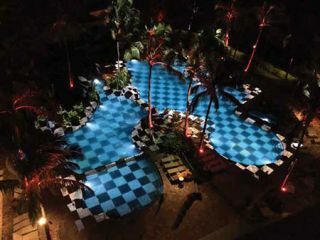 Sheraton Waikiki in Honolulu has launched its Helumoa Playground Superpool series, comprising two distinct 3D pool mapping light show stories presented twice every evening to entertain hotel guests and the general public. Billed as the world’s first permanent installation of its kind, the 3D pool mapping shows are projected across a 7,503-square foot pool canvas, demonstrating lively displays of volcanic eruptions and the rise of historical Hawaiian resorts and water sports. The Sheraton Waikiki hired PointCloud Media, a full-service production company specializing in 3D projections, to develop innovative, energized shows featuring graphic figures and images projected onto the nearly 200,000 gallon pool. The PointCloud solution integrates its core Raylight4D mapping system—responsible for superimposing visual content on the pool—with seven ultra-bright projectors and reliable, cost-efficient playback software from Renewed Vision. The integration of Renewed Vision’s ProVideoPlayer 2 (PVP2) software is significant as it drives playback for all seven projectors from two Mac Pro computers, saving PointCloud Media tens of thousands of dollars in comparison to expensive hardware-based packages. Additionally, PVP2 simplifies the overall workflow, allowing PointCloud Media to automate playout and quickly adjust show schedules in the event of inclement weather or special circumstances. The end-to-end architecture includes five rooftop Barco HDQ-2K40 40,000 lumen projectors positioned 320 feet in the air to project visual content onto the pool, along with two 20,000 lumen projectors at ground level to project visuals onto adjacent rock formations. The workflow starts with a 4000x4000 content file for the pool map and a 3840x1080 file for the rock formations. A Mac Pro running PVP2 at each location slices the 4000x4000 file into five separate 1920x1080 feeds with mild overlap. The fluid pool reflections and surrounding ambience add an element of reality to the custom 3D mapping projections. The master system on the roof is connected to the second rock projection system 31 stories below via a fiber-optic connection, with all content triggered simultaneously from both PVP2 servers. As each show begins, PVP2 triggers a contact closure relay to change the sound system from the standard background music service to the PVP2 audio feed. A third Mac Pro system outfitted with PVP2 supports a hotel broadcast on Channel 37, with viewers able to enjoy a live cut of the pool projections at the moment the light show music begins. PointCloud Media representatives routinely monitor the system from their offices near Dallas to ensure everything is working properly, with the ability to stop, pause, restart and reschedule shows as needed. A third, holiday-themed show is now in development, given the success of the first two shows. Additionally, the simple learning curve of the system will allow hotel staff to use the system for other business opportunities as desired.